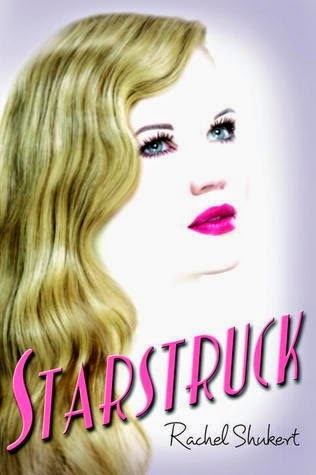 Starstruck was this vivid, engaging look into what 1930s Hollywood must have been like. In some ways, it's not all that different from what present day celebrities live through. The constant photos, lack of privacy, people passing judgement and cracks beneath what may seem like the perfect life. Margaret Frobisher is your typical high school girl who loves going to the movies, following her favorite celebrities and indulging her daydreams. According to her parents and their little high society circle, she's supposed to concentrate on becoming a distinguished lady and eventually marrying a reputable man. All that changes when she's approached by an agent and decides she wants to go for it. Turns out she's actually good! (Plus it helps that she's beautiful.) Before she knows it, it's goodbye little Margaret and hello to her new identity - Margo Sterling, up and coming starlet. I liked seeing Hollywood through Margo's eyes. We see how reality doesn't quite live to the fantasy and how being an actress isn't all it's cracked up to be. It really seems like the author did her homework and honestly, I didn't know people back then had a very low opinion of actresses! Maybe it's because I equate Audrey Hepburn with old Hollywood but Starstruck definitely shows the readers a different side and I enjoyed seeing that. As time goes on, we see what fame does to Margo's life and she does make some friends along the way: fellow actresses Gabby Preston and Amanda Farraday (the book actually alternates chapters between all of them) and her co-star Dane Forrest (who she obviously has "more than friends" sparks with. I loved these two!). The book basically follows Margo, Gabby and Amanda as they try to make it in Hollywood. It involves a lot of lies, scheming, changes and letting the public believe you're someone you're not. I think of the three girls, Margo tries to hold on to who she is the most and that's why I connected with her character. But Gabby and Amanda give us another necessary look into fame. Whereas Margo is beautiful, Gabby is cute and sweet which is to her disadvantage and Amanda has a reputation for "working" her way to the top. Aside from their three personal lives, there's also a mystery sub-plot which I can't say I cared for too much in the beginning but the way it unravels in the end definitely shocked and hooked me. Let's just say that by the last page, I was ready to buy the next book in this series (which I did!). Like I said earlier, Gabby and Amanda round out the view of Hollywood and how it affects each of them in different ways. But I didn't connect to their characters nearly as much as Margo. That said, I am interested in seeing what happens next for these two. Yes! I took a chance on Starstruck because it was gifted to me by Estelle and I'm so glad she passed this along to me. I really enjoyed reading a book where I felt like I was transported to another era. I still haven't read Starstruck! I have my copy now, since Macky brought it back to New York for me, and I'm encouraged/reminded to read it after seeing your thoughts. Just the idea of learning more about Hollywood in the 30s is very appealing, and is a major reason I definitely want to read this one!